Join Swing Left as we join up to talk to voters in our Swing District CA 10 to elect Democrat Josh Harder to replace Jeff Denham ! If you NEED or can PROVIDE A RIDE, visit OUR CARPOOL PAGE to travel to CA-10. If you need instructions on using our carpool form, visit the GroupCarpool instructions. IMPORTANT IF YOU ARE USING OUR CARPOOL FORM: If you need to change your plans, return to the site and edit or delete your information. Your driver is expecting to give you a ride unless you take yourself out of the car. It’s a good idea to check the carpool form before your canvass in case your driver has added any information. Drivers, if you cancel, please contact your riders via the email they left. Thanks! 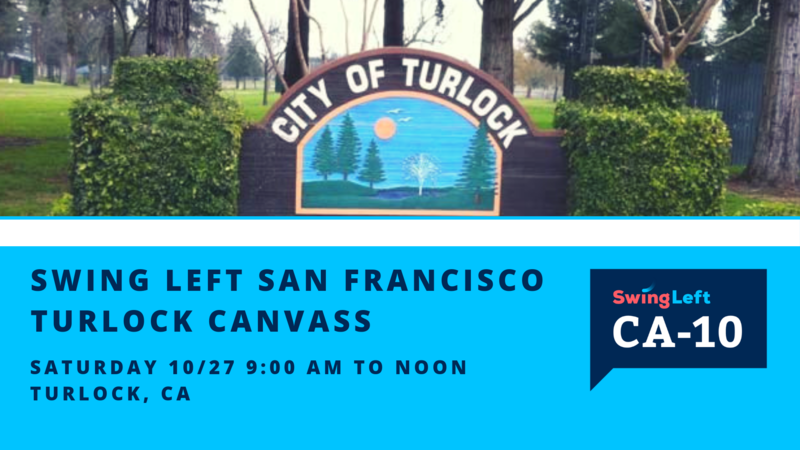 "Bring you own lunch" picnic at 1:45 after the canvass. We hope you can stay and have lunch with each other, share experiences and enjoy yourself after helping save our country ! Studies show that getting voters to “commit” in advance can meaningfully increase turnout, so this summer Swing Left volunteers across the country will be going out into their target Swing Districts to talk to voters, identify supporters and ask them to commit to vote in 2018. Swing Left will provide materials and online trainings so you have everything you need to know to have a great time and make a meaningful impact.